Home Blog Technology What is Device as a Service? We explain what it is and how it can benefit you. Device as a service (DaaS) is a growing solution which is dramatically changing the landscape of how SMEs are operating. Centred on flexibility, empowerment and scalability tailored for dynamic growing businesses, this agile approach boasts many benefits for employers and employees alike and is only set to evolve further as a growing trend. If you’d like to discover more about DaaS and how it is causing a stir amongst businesses, we’ve compiled some need-to-knows. What is Device as a Service (Daas)? Device as a service (Daas) is both an agile and scalable solution for small and medium-sized enterprises (SMEs). It offers businesses a flexible alternative to traditional leasing methods, enabling continued renewals of Apple devices, as well as the option for changes and additions to be made regularly. DaaS enables complete flexibility for employers and unlocks the potential for them to have the most up-to-date devices to complement their work requirements, business demands, and constant changes within their industry. DaaS is an agile subscription solution that offers an alternative option to traditional leasing for businesses. This new approach assists businesses that are looking to consistently scale, regularly introduce new staff as well as new equipment for their workforce. What are the Benefits of Device as a Service? DaaS is a cost-effective solution for businesses. With no admin fees and no penalties to add or remove devices throughout, together with the option to cancel with no fees, DaaS is a highly cost-effective solution. The money-saving nature of DaaS benefits IT buyers, who are thinking more as consumers and need to satisfy the demand for their business whist closely monitoring the price tag. Whatever devices your workforce require, DaaS offers the flexibility and freedom to meet their unique needs. Be it iMac, MacBook Pro, Air, iPad, iPhone or Mac Mini, the DaaS offering grants businesses the choice to select from a minimum of 20 Apple devices to start off their subscription. The needs of every business are unique, and SMEs can be safe in the knowledge that the flexible and attractive DaaS approach also delivers inclusive support. Whether you need advice on your plan, specific information on certain devices or are keen to explore your options further, you’ll receive all of the support you need to get the very most out of this agile service. Businesses require their staff to be equipped with the right technology at the right time, and DaaS enables just that.After a short 12-month time frame, devices can be either refreshed or swapped. This flexible approach to devices enables your staff to be fully equipped with the right devices to meet the ever-evolving demands of your business. Arming your staff with the right tools for the job will not only increase productivity and efficiency, but will create a feel-good-factor which is crucial within businesses for staff retention. A team equipped with the right devices are set for success, and the DaaS ability for staff to access brand new equipment from their first day means they will be more productive from the start. DaaS is not a lease agreement. There is no particular time frame that businesses are tied into and no specified commitment when it comes to DaaS that businesses are restricted to. The agile approach to DaaS enables devices to be both added or removed depending on the needs of your business. This is enabled without any penalties and adds to the flexible approach of the DaaS option. DaaS is a flexible solution with the needs of growing businesses at the forefront of its development. There is no longer a need to restrict your business’ cash flow, have that that pile of depreciating hardware in the cupboard, or have multiple lease agreements. 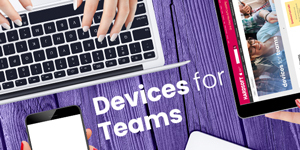 Devices for Teams is our unique and flexible Apple DaaS (Device as a Service) subscription tailored for dynamic, high growth businesses. Discover the many benefits of Device as a service in comparison to leasing or purchasing here. If you would like to find out more about our DaaS solutions and how they can impact on your business, give our sales team a call on 020 7111 1643, email sales@hardsoft.co.uk, or use our live web chat to speak to one of the HardSoft team.